This article contains Tibetan script. Without proper rendering support, you may see very small fonts, misplaced vowels or missing conjuncts instead of Tibetan characters. This article contains Lao text. Without proper rendering support, you may see question marks, boxes, or other symbols instead of Lao script. This article contains Khmer text. Without proper rendering support, you may see question marks, boxes, or other symbols instead of Khmer script. This article contains Burmese script. Without proper rendering support, you may see question marks, boxes, or other symbols instead of Burmese script. The Mekong is a trans-boundary river in Southeast Asia. It is the world's twelfth longest river and the seventh longest in Asia. Its estimated length is 4,350 km (2,703 mi), and it drains an area of 795,000 km2 (307,000 sq mi), discharging 475 km3 (114 cu mi) of water annually. From the Tibetan Plateau the river runs through China's Yunnan Province, Myanmar, Laos, Thailand, Cambodia, and Vietnam. In 1995, Laos, Thailand, Cambodia, and Vietnam established the Mekong River Commission (MRC) to manage and coordinate use of the Mekong's resources. In 1996 China and Myanmar became "dialogue partners" of the MRC and the six countries now work together in a cooperative framework. The extreme seasonal variations in flow and the presence of rapids and waterfalls in the Mekong make navigation difficult. Even so, the river is a major trade route between western China and Southeast Asia. 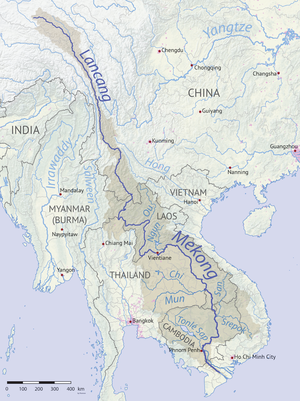 The English name "Mekong" derives from a contracted form of Thai and Lao Mae Nam Khong. In Thai and Lao, mae nam ('mother of water[s]') is used for any major river and Khong is the proper name. 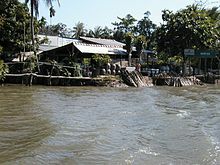 As such, Thai and Lao locals often refer to it in English as the "River Khong". Khong itself, however, is an archaic word meaning 'river' or 'the river', cognate with Chinese 江 whose Old Chinese pronunciation has been reconstructed as /*kˤroŋ/ and which long served as the proper name of the Yangtze before becoming a generic word for major rivers. In Khmer, Mékôngk is itself glossed as 'mother of water', from mé ('mother') and taking kôngk as a form of kôngkea ('water'). Thai: แม่น้ำโขง, [mɛ̂ː náːm kʰǒːŋ], or just 'แม่โขง'[mɛ̂ː kʰǒːŋ]. Lao: ແມ່ນ້ຳຂອງ, [mɛː nâːm kʰɔːŋ], ນ້ຳຂອງ [nâːm kʰɔːŋ]. Tai of Sipsong Panna, น้ำแม่ของ [nâːm mɛː kʰɔ̌ːŋ], น้ำของ [nâːm kʰɔ̌ːŋ]. Burmese: မဲခေါင်မြစ်, IPA: [mɛ́ɡàʊɴ mjɪ̰ʔ]. Shan: ၼမ်ႉၶွင် [nâm.kʰɔ̌ŋ] or ၼမ်ႉမႄႈၶွင် [nâm.mɛ.kʰɔ̌ŋ]. Khmer: មេគង្គ Mékôngk [meekoŋ], ទន្លេមេគង្គ Tônlé Mékôngk [tʊənlee meekoŋ]. Vietnamese: Sông Mê Kông (IPA: [ʂə̄wŋm mē kə̄wŋm]); Sông Cửu Long (Nine Dragons River [ʂə̄wŋm kɨ̂w lāwŋm]). Tibetan: རྫ་ཆུ་, Wylie: rDza chu, ZYPY: Za qu. Chinese: simplified Chinese: 澜沧江; traditional Chinese: 瀾滄江; pinyin: Láncāng Jiāng (from the old name of Lao kingdom Lan Xang). ទន្លេធំ Tônlé Thum [tʊənlee tʰom] ('Great River'). Khmuic: [ŏ̞m̥ kʰrɔːŋ̊], 'ŏ̞m̥' means 'river' or 'water', here it means 'river', 'kʰrɔːŋ̊' means 'canal'. So 'ŏ̞m̥ kʰrɔːŋ̊' means 'canal river'. In the ancient time Khmuic people called it '[ŏ̞m̥ kʰrɔːŋ̊ ɲă̞k̥]' or '[ŏ̞m̥ kʰrɔːŋ̊ ɟru̞ːʔ]' which means 'Jiant canal river' or 'deep canal river' respectively. The Mekong rises as the Za Qu and soon becomes known as the Lancang (Lantsang) in the "Three Rivers Source Area" on the Tibetan Plateau in the Sanjiangyuan National Nature Reserve; the reserve protects the headwaters of, from north to south, the Yellow (Huang He), the Yangtze, and the Mekong Rivers. It flows through the Tibetan Autonomous Region and then southeast into Yunnan Province, and then the Three Parallel Rivers Area in the Hengduan Mountains, along with the Yangtze to its east and the Salween River (Nujiang in Chinese) to its west. The Mekong then meets the tripoint of China, Myanmar and Laos. From there it flows southwest and forms the border of Myanmar and Laos for about 100 kilometres (62 mi) until it arrives at the tripoint of Myanmar, Laos, and Thailand. This is also the point of confluence between the Ruak River (which follows the Thai–Myanmar border) and the Mekong. The area of this tripoint is sometimes termed the Golden Triangle, although the term also refers to the much larger area of those three countries that was notorious as a drug producing region. From the Golden Triangle tripoint, the Mekong turns southeast to briefly form the border of Laos with Thailand. Khon Pi Long is a series of rapids along a 1.6-kilometre section of the Mekong River dividing Chiang Rai and Bokeo Province in Laos. The name of the rapids means "where the ghost lost its way". It then turns east into the interior of Laos, flowing first east and then south for some 400 kilometres (250 mi) before meeting the border with Thailand again. Once more, it defines the Laos-Thailand border for some 850 kilometres (530 mi) as it flows first east, passing the capital of Laos, Vientiane, then turns south. A second time, the river leaves the border and flows east into Laos soon passing the city of Pakse. Thereafter, it turns and runs more or less directly south, crossing into Cambodia. At Phnom Penh the river is joined on the right bank by the river and lake system the Tonlé Sap. When the Mekong is low, the Tonle Sap is a tributary: water flows from the lake and river into the Mekong. When the Mekong floods, the flow reverses: the floodwaters of the Mekong flow up the Tonle Sap. Immediately after the Sap River joins the Mekong by Phnom Penh, the Bassac River branches off the right (west) bank. The Bassac River is the first and main distributary of the Mekong. This is the beginning of the Mekong Delta. The two rivers, the Bassac to the west and the Mekong to the east, enter Vietnam shortly after this. In Vietnam, the Bassac is called the Hậu River (Sông Hậu or Hậu Giang); the main, eastern, branch of the Mekong is called the Tiền River or Tiền Giang. In Vietnam, distributaries of the eastern (main, Mekong) branch include the Mỹ Tho River, the Ba Lai River, the Hàm Luông River, and the Cổ Chiên River. Mekong River south of Chamdo. The Mekong Basin can be divided into two parts: the "upper Mekong basin" in Tibet of China, and the "lower Mekong basin" from Yunnan downstream from China to the South China Sea. From the point where it rises to its mouth, the most precipitous drop in the Mekong occurs in the upper Mekong basin, a stretch of some 2,200 km (1,400 mi). Here, it drops 4,500 metres (14,800 ft) before it enters the lower basin where the borders of Thailand, Laos, China, and Myanmar come together in the Golden Triangle. Downstream from the Golden Triangle, the river flows for a further 2,600 km (1,600 mi) through Laos, Thailand, and Cambodia before entering the South China Sea via a complex delta system in Vietnam. The upper basin makes up 24 percent of the total area and contributes 15-20 percent of the water that flows into the Mekong River. The catchment here is steep and narrow. Soil erosion has been a major problem and approximately 50 percent of the sediment in the river comes from the upper basin. In Yunnan Province in China, the river and its tributaries are confined by narrow, deep gorges. The tributary river systems in this part of the basin are small. Only 14 have catchment areas that exceed 1,000 km2 (390 sq mi), yet the greatest amount of loss of forest cover in the entire river system per square kilometer has occurred in this region due to heavy unchecked demand for natural resources. In the south of Yunnan, in Simao and Xishuangbanna Prefectures, the river changes as the valley opens out, the floodplain becomes wider, and the river becomes wider and slower. Major tributary systems develop in the lower basin. These systems can be separated into two groups: tributaries that contribute to the major wet season flows, and tributaries that drain low relief regions of lower rainfall. The first group are left bank tributaries that drain the high rainfall areas of Laos. The second group are those on the right bank, mainly the Mun and Chi Rivers, that drain a large part of northeast Thailand. Laos lies almost entirely within the lower Mekong basin. Its climate, landscape and land use are the major factors shaping the hydrology of the river. The mountainous landscape means that only 16 percent of the country is farmed under lowland terrace or upland shifting cultivation. With upland shifting agriculture (slash and burn), soils recover within 10 to 20 years but the vegetation does not. Shifting cultivation is common in the uplands of northern Laos and is reported to account for as much as 27 percent of the total land under rice cultivation. As elsewhere in the basin, forest cover has been steadily reduced during the last three decades by shifting agriculture and permanent agriculture. The cumulative impacts of these activities on the river regime have not been measured. However, the hydrological impacts of land cover changes induced by the Vietnam War were quantified in two sub-catchments of the lower Mekong River basin. Loss of forest cover in the Thai areas of the lower basin has been the highest of all the lower Mekong countries over the past 60 years. On the Khorat Plateau, which includes the Mun and Chi tributary systems, forest cover was reduced from 42 percent in 1961 to 13 percent in 1993. Although this part of northeast Thailand has an annual rainfall of more than 1,000 mm, a high evaporation rate means it is classified as a semi-arid region. Consequently, although the Mun and Chi basins drain 15 percent of the entire Mekong basin, they only contribute six percent of the average annual flow. Sandy and saline soils are the most common soil types, which makes much of the land unsuitable for wet rice cultivation. In spite of poor fertility, however, agriculture is intensive. Glutinous rice, maize, and cassava are the principal crops. Drought is by far the major hydrological hazard in this region. As the Mekong enters Cambodia, over 95 percent of its flows have already joined the river. From here on downstream the terrain is flat and water levels rather than flow volumes determine the movement of water across the landscape. The seasonal cycle of changing water levels at Phnom Penh results in the unique "flow reversal" of water into and out of the Great Lake via the Tonle Sap River. Phnom Penh also marks the beginning of the delta system of the Mekong River. Here the mainstream begins to break up into an increasing number of branches. In Cambodia, wet rice is the main crop and is grown on the flood plains of the Tonle Sap, Mekong, and Bassac (the Mekong delta distributary known as the Hậu in Vietnam) Rivers. More than half of Cambodia remains covered with mixed evergreen and deciduous broadleaf forest, but forest cover has decreased from 73 percent in 1973 to 63 percent in 1993. Here, the river landscape is flat. Small changes in water level determine the direction of water movement, including the large-scale reversal of flow into and out of the Tonle Sap basin from the Mekong River. 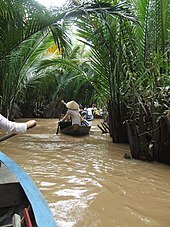 The Mekong delta in Vietnam is farmed intensively and has little natural vegetation left. Forest cover is less than 10 percent. In the Central Highlands of Vietnam, forest cover was reduced from over 95 percent in the 1950s to around 50 percent in the mid-1990s. Agricultural expansion and population pressure are the major reasons for land use and landscape change. Both drought and flood are common hazards in the Delta, which many people believe is the most sensitive to upstream hydrological change. Reach 1: Lancang Jiang or Upper Mekong River in China. In this part of the river, the major source of water flowing into the river comes from melting snow on the Tibetan plateau. This volume of water is sometimes called the "Yunnan component" and plays an important role in the low-flow hydrology of the lower mainstream. Even as far downstream as Kratie, the Yunnan component makes up almost 30 percent of the average dry season flow. A major concern is that the ongoing and planned expansion of dams and reservoirs on the Mekong mainstream in Yunnan could have a significant effect on the low-flow regime of the lower Mekong basin system. Reach 2: Chiang Saen to Vientiane and Nong Khai. This reach is almost entirely mountainous and covered with natural forest, although there has been widespread slash and burn agriculture. Although this reach could hardly be described as "unspoiled", the hydrological response is perhaps the most natural and undisturbed in all the lower basin. Many hydrological aspects of the lower basin start to change rapidly at the downstream boundary of this reach. Reach 3: Vientiane and Nong Khai to Pakse. The boundary between Reach 2 and 3 is where the Mekong hydrology starts to change. Reach 2 is dominated in both wet and dry seasons by the Yunnan Component. Reach 3 is increasingly influenced by contributions from the large left bank tributaries in Laos, namely the Nam Ngum, Nam Theun, Nam Hinboun, Se Bang Fai, Se Bang Hieng, and Se Done Rivers. The Mun-Chi river system from the right bank in Thailand enters the mainstream within this reach. Reach 4: Pakse to Kratie. The main hydrological contributions to the mainstream in this reach come from the Se Kong, Se San, and Sre Pok catchments. Together, these rivers make up the largest hydrological sub-component of the lower basin. Over 25 percent of the mean annual flow volume to the mainstream at Kratie comes from these three river basins. They are the key element in the hydrology of this part of the system, especially to the Tonle Sap flow reversal. Reach 5: Kratie to Phnom Penh. This reach includes the hydraulic complexities of the Cambodian floodplain, the Tonle Sap and the Great Lake. By this stage, over 95 percent of the total flow has entered the Mekong system. The focus turns from hydrology and water discharge to the assessment of water level, over- bank storage and flooding and the hydrodynamics that determine the timing, duration and volume of the seasonal flow reversal into and out of the Great Lake. Reach 6: Phnom Penh to the South China Sea. Here the mainstream divides into a complex and increasingly controlled and artificial system of branches and canals. Key features of flow behaviour are tidal influences and salt water intrusion. Every year, 35–50 percent of this reach is flooded during the rainy season. The impact of road embankments and similar infrastructure developments on the movement of this flood water is an increasingly important consequence of development. Table 2 summarises the mean annual flows along the mainstream. The mean annual flow entering the lower Mekong from China is equivalent to a relatively modest 450 mm depth of runoff. Downstream of Vientiane this increases to over 600 mm as the principal left bank tributaries enter the mainstream, mainly the Nam Ngum and Nam Theun. The flow level falls again, even with the right bank entry of the Mun-Chi system from Thailand. Although the Mun–Chi basin drains 20 percent of the lower system, average annual runoff is only 250 mm. Runoff in the mainstream increases again with the entry from the left bank of the Se Kong from southern Laos and Se San and Sre Pok from Vietnam and Cambodia. Table 2: Lower Mekong Mainstream annual flow (1960 to 2004) at selected sites. Flows at Chiang Saen entering the lower basin from Yunnan make up about 15 percent of the wet season flow at Kratie. This rises to 40 percent during the dry season, even this far downstream. During the wet season, the proportion of average flow coming from Yunnan rapidly decreases downstream of Chiang Saen, from 70 percent to less than 20 percent at Kratie. The dry season contribution from Yunnan is much more significant. The major portion of the balance comes from Laos, which points to a major distinction in the low-flow hydrology of the river. One fraction comes from melting snow in China and Tibet and the rest from over-season catchment storage in the lower basin. This has implications for the occurrence of drought conditions. For example, if runoff from melting snow in any given year is very low, then flows upstream of Vientiane-Nong Khai would be lower. In a large river system like the Mekong, seasonal flows can be quite variable from year to year. Although the pattern of the annual hydrograph is fairly predictable, its magnitude is not. The average monthly flows along the mainstream are listed in Table 3, providing an indication of their range and variability from year to year. At Pakse, for example, flood season flows during August would exceed 20,000 cubic metres per second nine years out of ten, but exceed 34,000 m3/s only one year in ten. Table 3: Mekong Mainstream monthly discharge, 1960-2004 (m3/s). There is little evidence from the last 45 years of data of any systematic changes in the hydrological regime of the Mekong. The Mekong is already heavily dammed, with many more dams planned and under construction. China has already built eight hydropower dams on the Mekong mainstream since 1995. As of November 2016, China has five more under construction, and another 11 planned or proposed. Laos has two dams under construction on the mainstream, and another seven planned or proposed; Cambodia has two planned or proposed. The Mekong is the fastest growing large river basin in the world in terms of hydropower construction. In December 2016, the Thai cabinet of Prime Minister Prayut Chan-o-cha agreed "in principle" with a plan to dredge stretches of the Mekong and demolish rocky outcrops that are hindrances to easy navigation. The international Lancang-Mekong River navigation improvement plan for 2015-2025, conceived by China, Myanmar, Lao, and Thailand, aims to the make the river more navigable for 500-tonne cargo ships sailing the river from Yunnan to Luang Prabang, a distance of 890 kilometres. China has been the driving force behind the demolition plan as it aims to expand trade in the area with larger cargo ships. The plan is split into two phases. The first phase, from 2015-2020, involves a survey, a design, and an assessment of the environmental and social impacts of the project. These have to be approved by the four countries involved, China, Laos, Myanmar, Thailand. The second phase (2020-2025) involves navigational improvements from Simao in China to 243 border posts in China and Myanmar, a distance of 259 km. The Mekong basin is one of the richest areas of biodiversity in the world. Only the Amazon boasts a higher level of biodiversity. Biota estimates for the Greater Mekong Subregion (GMS) include 20,000 plant species, 430 mammals, 1,200 birds, 800 reptiles and amphibians, and an estimated 850 freshwater fish species (excluding euryhaline species mainly found in salt or brackish water, as well as introduced species). The most species rich orders among the freshwater fish in the river basin are cypriniforms (377 species) and catfish (92 species). New species are regularly described from the Mekong. In 2009, 145 new species were described from the region, including 29 fish species previously unknown to science, two new bird species, 10 reptiles, five mammals, 96 plants, and six new amphibians. Between 1997 and 2015, an average of two new species per week were discovered in the region. The Mekong Region contains 16 WWF Global 200 ecoregions, the greatest concentration of ecoregions in mainland Asia. No other river is home to so many species of very large fish. 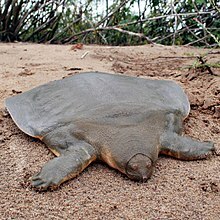 The biggest include three species of Probarbus barbs, which can grow up to 1.5 m (4.9 ft) and weigh 70 kg (150 lb), the giant freshwater stingray (Himantura polylepis, syn. H. chaophraya), which can reach at least 5 m (16 ft) in length and 1.9 m (6.2 ft) in width, the giant pangasius (Pangasius sanitwongsei), giant barb (Catlocarpio siamensis) and the endemic Mekong giant catfish (Pangasianodon gigas). The last three can grow up to about 3 m (9.8 ft) in length and weigh 300 kg (660 lb). All of these have declined drastically because of dams, flood control, and overfishing. One species of freshwater dolphin, the Irrawaddy dolphin (Orcaella brevirostris), was once common in the whole of the lower Mekong but is now very rare, with only 85 individuals remaining. Among other wetland mammals that have been living in and around the river are the smooth-coated otter (Lutra perspicillata) and fishing cat (Prionailurus viverrinus). The endangered Siamese crocodile (Crocodylus siamensis) occurs in small isolated pockets within the northern Cambodian and Laotian portions of the Mekong River. The saltwater crocodile (Crocodylus porosus) once ranged from the Mekong Delta up the river into Tonle Sap and beyond but is now extinct in the river, along with being extinct in all of Vietnam and possibly even Cambodia. Aquatic biodiversity in the Mekong River system is the second highest in the world after the Amazon. The Mekong boasts the most concentrated biodiversity per hectare of any river. The commercially valuable fish species in the Mekong are generally divided between "black fish", which inhabit low oxygen, slow moving, shallow waters, and "white fish", which inhabit well oxygenated, fast moving, deeper waters. People living within the Mekong River system generate many other sources of food and income from what are often termed "other aquatic animals" (OAAs) such as freshwater crabs, shrimp, snakes, turtles, and frogs. OAAs account for about 20 percent of the total Mekong catch. When fisheries are discussed, catches are typically divided between the wild capture fishery (i.e., fish and other aquatic animals caught in their natural habitat), and aquaculture (fish reared under controlled conditions). Wild capture fisheries play the most important role in supporting livelihoods. Wild capture fisheries are largely open access fisheries, which poor rural people can access for food and income. Broadly, there are three types of fish habitats in the Mekong: i) the river, including all the main tributaries, rivers in the major flood zone, and the Tonle Sap, which altogether yield about 30 percent of wild catch landings; ii) rain-fed wetlands outside the river-floodplain zone, including mainly rice paddies in formerly forested areas and usually inundated to about 50 cm, yielding about 66 percent of wild catch landings; and iii) large water bodies outside the flood zone, including canals and reservoirs yielding about four percent of wild catch landings. The Mekong Basin has one of the world's largest and most productive inland fisheries. An estimated two million tonnes of fish are landed a year, in addition to almost 500,000 tonnes of other aquatic animals. Aquaculture yields about two million tonnes of fish a year. Hence, the lower Mekong basin yields about 4.5 million tonnes of fish and aquatic products annually. The total economic value of the fishery is between US$3.9 and US$7 billion a year. Wild capture fisheries alone have been valued at US$2 billion a year. This value increases considerably when the multiplier effect is included, but estimates vary widely. An estimated 2.56 million tonnes of inland fish and other aquatic animals are consumed in the lower Mekong every year. Aquatic resources make up between 47 and 80 percent of animal protein in rural diets for people who live in the Lower Mekong Basin. Fish are the cheapest source of animal protein in the region and any decline in the fishery is likely to significantly impact nutrition, especially among the poor. The size of this impact has not been established. It is estimated that 40 million rural people, more than two-thirds of the rural population in the lower Mekong basin, are engaged in the wild capture fishery. Fisheries contribute significantly to a diversified livelihood strategy for many people, particularly the poor, who are highly dependent on the river and its resources for their livelihoods. They provide a principal form of income for numerous people and act as a safety net and coping strategy in times of poor agricultural harvests or other difficulties. In Laos alone, 71 percent of rural households (2.9 million people) rely on fisheries for either subsistence or additional cash income. Around the Tonle Sap Lake in Cambodia, more than 1.2 million people live in fishing communes and depend almost entirely on fishing for their livelihoods. For thousands of years the Mekong River has been an important conduit for people and goods between the many towns on its banks. 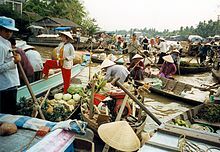 Traditional forms of trade in small boats linking communities continue today, however the river is also becoming an important link in international trade routes, connecting the six Mekong countries to each other, and also to the rest of the world. The Mekong is still a wild river and navigation conditions vary greatly along its length. Broadly, navigation of the river is divided between upper and lower Mekong, with the "upper" part of the river defined as the stretch north of the Khone Falls in southern Laos and the "lower" part as the stretch below these falls. Narrower and more turbulent sections of water in the upstream parts of the Mekong River, coupled with large annual water level variations continue to present a challenge to navigation. The seasonal variations in water level directly affect trade in this section of the river. Volumes of trade being shipped decrease by more than 50 percent, primarily due to the reduced draughts available during the low water season (June–January). Despite these difficulties, the Mekong River is already an important link in the transit chain between Kunming and Bangkok with about 300,000 tonnes of goods shipped via this route each year. The volume of this trade is expected to increase by 8–11 percent per year. Port infrastructure is being expanded to accommodate the expected growth in traffic, with new facilities planned for Chiang Saen port. In Laos, 50 and 100 DWT vessels are operated for regional trade. Cargos carried are timber, agricultural products, and construction materials. Thailand imports a wide variety of products from China, including vegetables, fruit, agricultural products, and fertilisers. The main exports from Thailand are dried longan, fish oil, rubber products, and consumables. Nearly all the ships carrying cargo to and from Chiang Saen Port are 300 DWT Chinese flag vessels. Waterborne trade in the lower Mekong countries of Vietnam and Cambodia has grown significantly, with trends in container traffic at Phnom Penh port and general cargo through Can Tho port both showing steady increases until 2009 when a decrease in cargo volumes can be attributed to the global financial crisis and a subsequent decline in demand for the export of garments to the US. In 2009, Mekong trade received a significant boost with the opening of a new deep-water port at Cai Mep in Vietnam. This new port has generated a renewed focus on the Mekong River as a trade route. The Cai Mep container terminals can accommodate vessels with a draught of 15.2 m, equivalent to the largest container ships in the world. These mother vessels sail directly to Europe or the United States, which means that goods can be shipped internationally to and from Phnom Penh with only a single transshipment at Cai Mep. Agreement between China and Lao PDR on Freight and Passenger Transport along the Lancang–Mekong River, adopted in November 1994. Agreement on the Cooperation for the Sustainable Development of the Mekong River Basin, Article 9, Freedom of Navigation, 5 April 1995, Chiang Rai. Hanoi Agreement between Cambodia and Viet Nam on Waterway Transportation, 13 December 1998. Agreement between and among the Governments of the Laos, Thailand, and Vietnam for Facilitation of Cross border Transport of Goods and People, (amended at Yangon, Myanmar), signed in Vientiane, 26 November 1999. Agreement on Commercial Navigation on Lancang–Mekong River among the governments of China, Laos, Myanmar and Thailand, adopted at Tachileik, 20 April 2000. Phnom Penh Agreement between Cambodia and Vietnam on the Transit of Goods, 7 September 2000. New Agreement on Waterway Transportation between Vietnam and Cambodia, signed in Phnom Penh, 17 December 2009. The internal drainage patterns of the Mekong are unusual when compared to those of other large rivers. Most large river systems that drain the interiors of continents, such as the Amazon, Congo, and Mississippi, have relatively simple dendritic tributary networks that resemble a branching tree. Typically, such patterns develop in basins with gentle slopes where the underlying geological structure is fairly homogenous and stable, exerting little or no control on river morphology. In marked contrast, the tributary networks of the Salween, Yangtze, and particularly the Mekong, are complex with different sub-basins often exhibiting different, and distinct, drainage patterns. These complex drainage systems have developed in a setting where the underlying geological structure is heterogeneous and active, and is the major factor controlling the course of rivers and the landscapes they carve out. The elevation of the Tibetan Plateau during the Tertiary period was an important factor in the genesis of the south-west monsoon, which is the dominant climatic control influencing the hydrology of the Mekong Basin. Understanding the nature and timing of the elevation of Tibet (and the Central Highlands of Vietnam) therefore helps explain the provenance of sediment reaching the delta and the Tonle Sap Great Lake today. Studies of the provenance of sediments in the Mekong delta reveal a major switch in the source of sediments about eight million years ago (Ma). From 36 to 8 Ma the bulk (76 percent) of the sediments deposited in the delta came from erosion of the bedrock in the Three Rivers Area. From 8 Ma to the present, however, the contribution from the Three Rivers Area fell to 40 percent, while that from the Central Highlands rose from 11 to 51 percent. One of the most striking conclusions of provenance studies is the small contribution of sediment from the other parts of the Mekong basin, notably the Khorat Plateau, the uplands of northern Laos and northern Thailand, and the mountain ranges south of the Three Rivers area. The last glacial period came to an abrupt end about 19,000 years ago (19 ka) when sea levels rose rapidly, reaching a maximum of about 4.5 m above present levels in the early Holocene about 8 ka. At this time the shoreline of the South China Sea almost reached Phnom Penh and cores recovered from near Angkor Borei contained sediments deposited under the influence of tides, and salt marsh and mangrove swamp deposits. Sediments deposited in the Tonle Sap Great Lake about this time (7.9–7.3 ka) also show indications of marine influence, suggesting a connection to the South China Sea. Although the hydraulic relationships between the Mekong and the Tonle Sap Great Lake systems during the Holocene are not well understood, it is clear that between 9,000 and 7,500 years ago the confluence of the Tonle Sap and the Mekong was in proximity to the South China Sea. The present river morphology of the Mekong Delta developed over the last 6,000 years. During this period, the delta advanced 200 km over the continental shelf of the South China Sea, covering an area of more than 62,500 km2. From 5.3 to 3.5 ka the delta advanced across a broad embayment formed between higher ground near the Cambodian border and uplands north of Ho Chi Minh City. During this phase of its development the delta was sheltered from the wave action of long-shore currents and was constructed largely through fluvial and tidal processes. At this time the delta was advancing at a rate of 17–18 m per year. After 3.5 ka, however, the delta had built out beyond the embayment and became subject to wave action and marine currents. These deflected deposition south-eastwards in the direction of the Cà Mau Peninsula, which is one of the most recent features of the delta. For much of its length the Mekong flows through bedrock channels, i.e., channels that are confined or constrained by bedrock or old alluvium in the bed and riverbanks. Geomorphologic features normally associated with the alluvial stretches of mature rivers, such as meanders, oxbow lakes, cut-offs, and extensive floodplains are restricted to a short stretch of the mainstream around Vientiane and downstream of Kratie where the river develops alluvial channels that are free of control exerted by the underlying bedrock. The difficulty of navigating the river has meant that it has divided, rather than united, the people who live near it. The earliest known settlements date to 210 BCE, with Ban Chiang being an excellent example of early Iron Age culture. The earliest recorded civilization was the 1st century Indianised-Khmer culture of Funan, in the Mekong delta. Excavations at Oc Eo, near modern An Giang, have found coins from as far away as the Roman Empire. This was succeeded by the Khmer culture Chenla state around the 5th century. The Khmer empire of Angkor was the last great Indianized state in the region. From around the time of the fall of the Khmer empire, the Mekong was the front line between the emergent states of Siam and Tonkin (North Vietnam), with Laos and Cambodia, then on the coast, torn between their influence. The first European to encounter the Mekong was the Portuguese Antonio de Faria in 1540. A European map of 1563 depicts the river, although even by then little was known of the river upstream of the delta. European interest was sporadic: the Spanish and Portuguese mounted some missionary and trade expeditions, while the Dutch Gerrit van Wuysthoff led an expedition up the river as far as Vientiane in 1641–42. The French invaded the region in the mid-19th century, capturing Saigon in 1861, and establishing a protectorate over Cambodia in 1863. 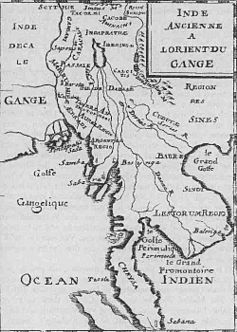 The first systematic European exploration began with the French Mekong Expedition led by Ernest Doudard de Lagrée and Francis Garnier, which ascended the river from its mouth to Yunnan between 1866 and 1868. Their chief finding was that the Mekong had too many falls and rapids to ever be useful for navigation. The river's source was found by Pyotr Kuzmich Kozlov in 1900. From 1893, the French extended their control of the river into Laos, establishing French Indochina by the first decade of the 20th century. This lasted until the First and Second Indochina Wars expelled French from its former colony and defeated US-supported governments. During the wars in Indochina in the 1970s, a significant quantity of explosives (sometimes, entire barges loaded with military ordnance) sank in the Cambodian section of the Mekong (as well as in the country's other waterways). Besides being a danger for fishermen, unexploded ordnance also creates problems for bridge and irrigation systems construction. As of 2013, Cambodian volunteers are being trained, with the support of the Office of Weapons Removal and Abatement within the US State Department Bureau of Political-Military Affairs, to conduct underwater explosive removal. Construction of Myanmar–Laos Friendship Bridge started on 19 February 2013. The bridge will be 691.6 meters long and have 8.5 meters wide two-lane motorway. The Thai–Lao Friendship Bridge (Thai: สะพานมิตรภาพ ไทย-ลาว; RTGS: saphan mittra phap thai-lao) connects Nong Khai city with Vientiane in Laos. The 1,170-metre-long (3,840 ft) bridge opened on 8 April 1994. It has two 3.5-metre-wide (11 ft) lanes with a single railway line in the middle. On 20 March 2004, the Thai and Lao governments agreed to extend the railway to Tha Nalaeng in Laos. This extension has since been completed. The Second Thai–Lao Friendship Bridge connects Mukdahan to Savannakhet. The two-lane, 12-metre-wide (39 ft), 1,600-metre-long (5,200 ft) bridge opened to the public on 9 January 2007. The Third Thai–Lao Friendship Bridge opened for traffic on 11 November 2011, connecting Nakhon Phanom Province (Thailand) and Thakhek (Laos), as part of Asian Highway 3. The Chinese and Thai governments agreed to build the bridge and share the estimated US$33 million cost. The Fourth Thai–Lao Friendship Bridge opened to traffic on 11 December 2013. It links Chiang Rai Province, Thailand with Ban Houayxay, Laos. There is one bridge over the Mekong entirely within Laos. Unlike the Friendship Bridges, it is not a border crossing. It is at Pakse in Champasak Province. It is 1,380 meters (4,528 ft) long, and was completed in 2000. 15°6′19.95″N 105°48′49.51″E﻿ / ﻿15.1055417°N 105.8137528°E﻿ / 15.1055417; 105.8137528﻿ (Pakxe)). The Kizuna Bridge is in Cambodia, in the city of Kampong Cham, on the road linking Phnom Penh with the remote provinces of Ratanakiri and Mondolkiri, and Laos. The bridge opened for traffic on 11 December 2001. The Prek Tamak Bridge, 40 km north of Phnom Penh opened in 2010. Phnom Penh itself has no bridge under construction yet, although two new bridges have recently opened on the Tonle Sap, and the main bridge on the highway to Ho Chi Minh was duplicated in 2010. Another new bridge was built at Neak Leung on the Phnom Penh to Ho Chi Minh Highway 1 with Japanese government assistance, and opened in 2015. In Vietnam, since the year 2000 Mỹ Thuận Bridge crosses the first channel—the left, main branch of the Mekong, the Sông Tiền or Tiền Giang—near Vĩnh Long and since 2008 Rạch Miễu Bridge crosses it near Mỹ Tho, between the provinces of Tiền Giang and Bến Tre. Cần Thơ Bridge crosses the second channel—the right, main distributary of the Mekong, the Bassac (Song Hau). Inaugurated in 2010, it is the longest main span cable-stayed bridge in Southeast Asia. The headwaters of the Mekong in Zadoi County, Qinghai, China, are protected in Sanjiangyuan National Nature Reserve. The name Sanjiangyuan means "the sources of the Three Rivers". The reserve also includes the headwaters of the Yellow River and the Yangtze. The section of the river flowing through deep gorges in Yunnan Province is part of the Three Parallel Rivers of Yunnan Protected Areas and is a UNESCO World Heritage Site. The Tonle Sap Biosphere Reserve in Cambodia contains the largest lake in Southeast Asia. It is a UNESCO Biosphere reserve. Bank erosion on the Song Tien, a Mekong branch, Binh Dai District, Ben Tre Province, Vietnam. The low tide level of the river in Cambodia is lower than the high tide level out at sea, and the flow of the Mekong inverts with the tides throughout its stretch in Vietnam and up to Phnom Penh. The very flat Mekong delta area in Vietnam is thus prone to flooding, especially in the provinces of An Giang and Dong Thap (Đồng Tháp), near the Cambodian border. Sewage treatment is rudimentary in towns and urban areas throughout much of the Mekong's length, such as Vientiane in Laos. Water pollution impacts the river's ecological integrity as a result. Much of the 8.3 billion tonnes of plastic present on earth makes its way to the oceans. Ninety percent of plastic in the oceans is flushed there by just 10 rivers. The Mekong is one of them. ^ "Ramsar List". Ramsar.org. Archived from the original on 9 April 2013. Retrieved 12 April 2013. ^ a b S. Liu; P. Lu; D. Liu; P. Jin; W. Wang (2009). "Pinpointing source and measuring the lengths of the principal rivers of the world". International Journal of Digital Earth. 2 (1): 80–87. doi:10.1080/17538940902746082. ^ a b c d e f g h i j k l m n o p q r s t u "State of the Basin Report, 2010" (PDF). Mekong River Commission. Vientiane. 2010. ^ Wangkiat, Paritta (15 January 2017). "Against the flow". Bangkok Post (Spectrum). Retrieved 3 May 2018. ^ a b c d e f g h i j k l m n o p q r s t u v w x y z aa ab Mekong River Commission (2005). "Overview of the Hydrology of the Mekong Basin" (PDF). MRC, Vientiane, Laos. ^ G. Lacombe; A. Pierret; C. T. Hoanh; O. Sengtaheuanghoung; A. Noble (2010). "Conflict, migration and land-cover changes in Indochina: a hydrological assessment". Ecohydrology. 3 (4): 382–391. doi:10.1002/eco.166. ^ Michael Buckley (30 March 2015). "The Price of Damming Tibet's Rivers". The New York Times. New Delhi. p. A25. Archived from the original on 31 March 2015. Retrieved 1 April 2015. Other plans call for diversion of water from the Brahmaputra, Salween and Mekong — all rivers that cross national boundaries. ^ Yeophantong, Pichamon (2014). "China's Lancang Dam Cascade and Transnational Activism in the Mekong Region: Who's Got the Power?". Asian Survey. 54 (4): 700–724. doi:10.1525/as.2014.54.4.700. ^ "Requiem for a river". The Economist. Retrieved 18 February 2016. ^ a b Suksamran, Nauvarat (9 January 2017). "Locals slam Mekong blasting plan". Bangkok Post. Retrieved 9 January 2017. ^ "Spare the Mekong" (Editorial). Bangkok Post. 30 December 2016. Retrieved 30 December 2016. ^ K. G. Hortle (2009). "Fishes of the Mekong – how many species are there?". "Catch and Culture". Mekong River Commission. Archived from the original on 30 July 2012. ^ N. Gephart; G. Blate; C. McQuistan; C. Thompson (2010). "New Blood: Greater Mekong New Species Discoveries, 2009" (PDF). WWF. ^ "163 new species, including 'Klingon Newt', discovered". Fox News. 20 December 2016. Retrieved 20 December 2016. ^ a b c "River of Giants: Giant Fish of the Mekong" (PDF). WWF Greater Mekong Program. 2012. ^ Froese, Rainer, and Daniel Pauly, eds. (2017). Species of Probarbus in FishBase. February 2017 version. ^ Last, P.R. ; Compagno, L.J.V. (1999). "Myliobatiformes: Dasyatidae". In Carpenter, K.E. ; Niem, V.H. (eds.). FAO identification guide for fishery purposes. The living marine resources of the Western Central Pacific. Food and Agriculture Organization of the United Nations. pp. 1479–1505. ISBN 92-5-104302-7. ^ Ryan, Gerard Edward; Dove, Verne; Trujillo, Fernando; Doherty, Paul F. (2011). "Irrawaddy dolphin demography in the Mekong River: an application of mark–resight models". Ecosphere. 2 (5): art58. doi:10.1890/ES10-00171.1. ^ a b c International Center for Environmental Management (2010). "Strategic Environmental Assessment (SEA) of hydropower on the Mekong mainstream" (PDF). Mekong River Commission. ^ J.W. Ferguson; M. Healey; P. Dugan; C. Barlow (2011). "Potential Effects of Dams on Migratory Fish in the Mekong River: Lessons from the Fraser and Columbia Rivers". Environmental Management. 47 (1): 141–159. Bibcode:2011EnMan..47..141F. doi:10.1007/s00267-010-9563-6. ^ J. Valbo-Jørgensen, D. Coates & K.G. Hortle (2009). "Fish diversity in the Mekong River Basin.". In I.C. Campbell (ed.). The Mekong: Biophysical Environment of an International River Basin. London: Elsevier Publishers. pp. 161–196. ISBN 978-0123740267. ^ a b c E. Baran & C. Myschowoda (2009). "Dams and fisheries in the Mekong Basin". Aquatic Ecosystem Health and Management. 12 (3): 227–234. doi:10.1080/14634980903149902. ^ a b c d e E. Baran & B. Ratner (2007). "The Don Sahong Dam and Mekong Fisheries" (PDF). Science Brief. World Fish Center. ^ K. G. Hortle (2007). "Consumption and the yield of fish and other aquatic animals from the Lower Mekong Basin" (PDF). MRC Technical Paper No. 16. Mekong River Commission. ^ a b S. Bush (2007). "Give a man a fish..." Contextualising Living Aquatic Resources Development in the Lower Mekong Basin" (PDF). AMRC Working Papers 8. Australian Mekong Resource Centre, University Of Sydney. ^ a b c R. Friend & D. J. H. Blake (2009). "Negotiating trade-offs in water resources development in the Mekong Basin: implications for fisheries and fishery-based livelihoods". Water Policy. 11 (S1): 13–30. doi:10.2166/wp.2009.001. ^ I. G. Baird (2011). "The Don Sahong Dam". Critical Asian Studies. 43 (2): 211–235. doi:10.1080/14672715.2011.570567. ^ M. Clark; L. Schoenbohm; L. Royden; K. Whipple; B. Burchfiel; W. Zhang; W. Tang; E. Wang; L. Chen (2004). "Surface uplift, tectonics, and erosion of eastern Tibet from large-scale drainage patterns". Tectonics. 23 (TC1006): 227–234. Bibcode:2004Tecto..23.1006C. doi:10.1029/2002TC001402. ^ C. Twidale (2004). "River patterns and their meanings". Earth-Science Reviews. 67 (3–4): 159–218. Bibcode:2004ESRv...67..159T. doi:10.1016/j.earscirev.2004.03.001. ^ S. K. Tandon & R. Sinha (2007). "Geology of large river systems". In A. Gupta (ed.). Large rivers: geomorphology and management. London: John Wiley & Sons. pp. 7–28. ISBN 978-0-470-84987-3. ^ P. D. Clift & A. R. Plumb (2008). The Asian monsoon: causes, history, and effects. Cambridge, UK: Cambridge University Press. ISBN 9780521847995. ^ P. D. Clift; A. Carter; I. H. Campbell; M. Pringle; V. Nguyen; C. Allen; C. M. Allen; K. V. Hodges; T. T Mai (2006). "Thermochronology of mineral grains in the Red and Mekong Rivers, Viet Nam: Provenance and exhumation implications for Southeast Asia". Geochemisty, Geophysics, Geosystems. 7 (10): 1–28. Bibcode:2006GGG.....710005C. doi:10.1029/2006GC001336. ^ P. D. Clift, G. Layne & J. Blusztajn (2004). "Marine sedimentary evidence for monsoon strengthening, Tibetan uplift, and drainage evolution in East Asia". Geophysical Monograph Series. 149 (2004): 255–282. Bibcode:2004GMS...149..255C. doi:10.1029/149GM14. ^ a b T. Tamura; Y. Saito; S. Sotham; B. Bunnarin; K. Meng; S. Im; S. Choup; F. Akiba (2009). "Initiation of the Mekong River Delta at 8 ka: Evidence from the sedimentary succession in the Cambodian lowland". Quaternary Science Reviews. 28 (3–4): 327–344. Bibcode:2009QSRv...28..327T. doi:10.1016/j.quascirev.2008.10.010. ^ D. Penny (2006). "The Holocene history and development of the Tonle Sap, Cambodia". Quaternary Science Reviews. 25 (3–4): 310–322. Bibcode:2006QSRv...25..310P. doi:10.1016/j.quascirev.2005.03.012. ^ T. K. Ta; V. L. Nguyen; M. Tateishi; I. Kobayashi; S. Tanabe; Y. Saito (2002). "Holocene delta evolution and sediment discharge of the Mekong River, Southern Viet Nam". Quaternary Science Reviews. 21 (16–17): 1807–1819. Bibcode:2002QSRv...21.1807T. doi:10.1016/S0277-3791(02)00007-0. ^ C. H. Fenton, P. Charusiri & S. H. Wood (2003). "Recent paleoseismic investigations in northern and western Thailand". Annals of Geophysics. 46 (5): 957–981. ^ Franzen, Harald (20 July 2017). "There are 8.3 billion tons of plastic in the world". Deutsche Welle. Retrieved 17 April 2018. ^ Franzen, Harald (30 November 2017). "Almost all plastic in the ocean comes from just 10 rivers". Deutsche Welle. Retrieved 17 April 2018. Kuenzer, C., I. Campbell, M. Roch, P. Leinenkugel, V. Q. Tuan and S. Dech (2012): Understanding the impact of hydropower developments in the context of upstream–downstream relations in the Mekong river basin. In: Sustainability Science 8 (4), pp. 565-584. DOI: 10.1007/s11625-012-0195-z. Kuenzer, C., H. Guo, J. Huth, P. Leinenkugel, X. Li and S. Dech (2013): Flood Mapping and Flood Dynamics of the Mekong Delta. ENVISAT-ASAR-WSM Based Time-Series Analyses. In: Remote Sensing 5, pp. 687–715. DOI: 10.3390/rs5020687. Leinenkugel, P., C. Kuenzer, N. Oppelt and S. Dech (2013): Characterisation of land surface phenology and land cover based on moderate resolution satellite data in cloud prone areas — A novel product for the Mekong Basin. In: Remote Sensing of Environment 136, pp. 180–198. DOI: 10.1016/j.rse.2013.05.004. Moder, F., C. Kuenzer, Z. Xu, P. Leinenkugel and Q. Bui Van (2012): IWRM for the Mekong Basin. In: Renaud, F. G. and C. Kuenzer (eds. ): The Mekong Delta System. Interdisciplinary Analyses of a River Delta. Dordrecht: Springer, pp. 133–166. Renaud, F. G. und C. Kuenzer (2012): The Mekong Delta System. Interdisciplinary Analyses of a River Delta (= Springer Environmental Science and Engineering). Dordrecht: Springer. ISBN 978-94-007-3961-1. Kuenzer, C. and F. G. Renaud (2012): Climate Change and Environmental Change in River Deltas Globally. In: Renaud, F. G. and C. Kuenzer (eds. ): The Mekong Delta System. Interdisciplinary Analyses of a River Delta. Dordrecht: Springer, pp. 7–48. Kuenzer, C. (2014): Remote Sensing the Mekong. In: International Journal of Remote Sensing 35 (8), pp. 2747-2751. DOI: 10.1080/01431161.2014.890377. Kuenzer, C., P. Leinenkugel, M. Vollmuth and S. Dech (2014): Comparing global land-cover products – implications for geoscience applications: an investigation for the trans-boundary Mekong Basin. In: International Journal of Remote Sensing 35 (8), pp. 2752-2779. DOI: 10.1080/01431161.2014.890305. 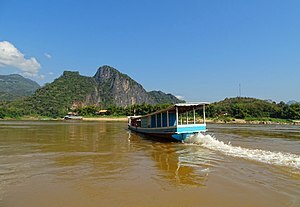 Wikimedia Commons has media related to Mekong.